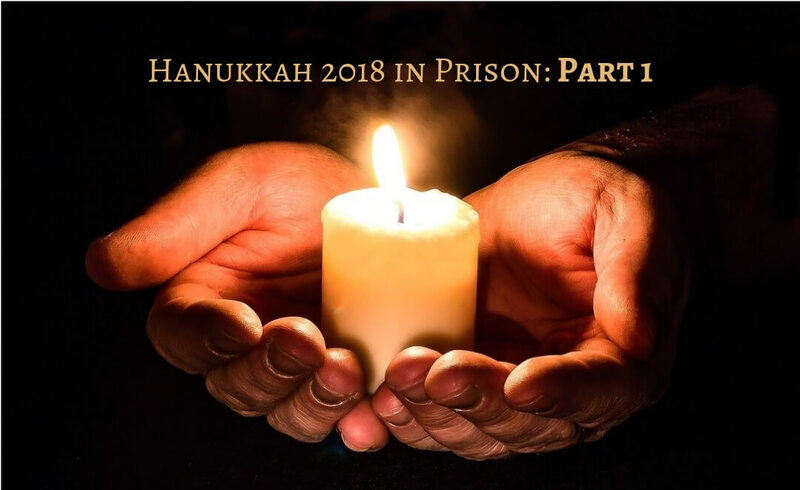 Last night was our first night of Hanukkah here at the Marion prison camp. It was a great time as we dug deep into the Word and began the process of rededicating our own temples once again during this year’s Festival of Lights. Along the way some cool revelations came that I would like to share through this series of posts. It started with us being given our hanukkia. Last year we had a beautiful silver one that really set the mood. This year? Well, it’s a block of wood with nine holes drilled in it, all of which are charred with small wicks sprouting up from previous candles having melted into complete oblivion. Quite frankly, it looked like something out of Tales from the Crypt. But we’re grateful to have one at all and so made do. My new friend Tom, who, believe it or not, was the president of a Bible college, opened in prayer. My good buddy Juan was there with another friend, and we have a couple more coming tomorrow. We reviewed the story of the first Hanukkah, including the bravery of Judah Maccabee and company and how they freed the Jewish people from the oppression of the Greeks and, more importantly, freed his people to be able to worship the God of their ancestors in the prescribed ways. I began to talk about the importance of the menorah in the temple and how it was the instrument that allowed the priests to see the bread they were required to eat daily, bread that was directly across from the menorah. Connection? Yeshua is the menorah that lights our temple. If that light is not shining through you it will not be possible for you, as a priest, to see the spiritual bread you are required to eat. When we’re walking by faith we see the manna from heaven that feeds our spirit-man. We hear His still, small voice. We see His hand at work in the most subtle ways. We make the connections and see the breadcrumbs He leaves for us to help guide us in the right direction. When we walk by our own sight and compromise His Word, even subtly, the light of the spiritual menorah inside us goes dark immediately and we miss the power of God in our lives. Only one light can be on at a time. Either we walk by faith and the light of His word, or we walk by the light of our logic. One leads to light, one leads to darkness. Compromise leads to a complete defamation of His temple and starts putting out candles left and right. When Yeshua said to let your light shine before men, that means that He expects our lamps to be all lit. The more lamps of your inner menorah are lit, the easier it is to see in the dark. To find your way. Unfortunately, it also attracts a lot of unwanted bugs. But outside of those – human – bugs that are always known by their grumpy characteristics, it also attracts those who are walking in darkness and looking for the light. It helps them find their way, as well. Your light becomes their Yeshua until their light is strong enough to burn on its own. This is why it’s critical that we live a holy, set apart life. Anything less will diminish our light and confuse those who are relying on you for their light. The more light that is shining through you the more impact you will have on people around you. How many lamps are you burning? Are you being the full light that you can be? Would you be proud for a new believer to follow your light in everything you do? Can you say like Paul, "follow me as I follow Christ?" God's Plan A is for us to be the light of the world. He has no Plan B.